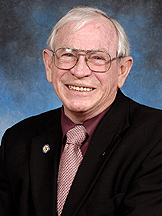 Ernest L. (Ernie) Hall is Professor Emeritus of Computer Science and Mechanical Engineering in the School of Dynamic Systems at the University of Cincinnati. He was formerly the Paul E. Geier Professor of Robotics in the Department of Mechanical Engineering at the University of Cincinnati and Professor in the Department of Computer Science. He has also held joint appointments with the Department of Electrical and Computer Engineering and Computer Science and collaborates with many faculty and students in the College of Engineering, the College of Medicine, the College of Education, the College of Applied Science and the College of Design, Art, Architecture and Planning and local and national and international civic groups including the First Lego League, the Ohio Academy of Science and the Society of Manufacturing Engineers.